They say you can get lost in a good book. But it's worse to get lost in a bad one . 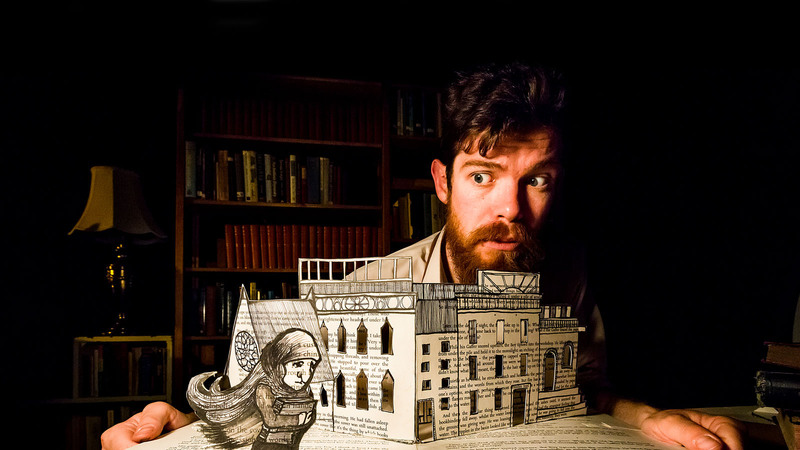 . .
And so begins the magically intriguing journey of The Bookbinder, created by the inventive artists of New Zealand’s award-winning Trick of the Light Theatre. This one-person show, written by Ralph McCubbin Howell and directed by Hannah Smith, pays homage to Old World fairy tale traditions with touches of darkness, mystery, and high-stakes daring as an apprentice bookbinder gets rather too engaged in his work. Trick of the Light employs puppetry, shadow play, music, and paper art, all bound together in a mayhem-filled fable for curious children and adventurous adults. Connects to Illinois Learning Standards in Fine Arts, Social/Emotional Learning, Social Sciences, and Science.